The study, by Lt Gen Chris Brown, was commissioned in the light of mounting evidence of the failure to prepare properly for the invasion and its consequences. Former senior military officers and defence officials have already described their anger and frustration about the failures in damning testimony to the Chilcot inquiry into the 2003 Iraq invasion. One of the inquiry's key objectives is to spell out the lessons that should be learned from what is widely regarded in Whitehall as an ill-conceived operation of dubious legality and, in foreign policy terms, a disaster comparable to the 1956 Suez crisis. If the study revealed the invasion of Iraq to be a War Crime then that'd be good reason for covering it up. I don't think the report here deals simply with mere incompetence. When the patsy, Sirhan Sirhan, most likely under the influence of scopolamine, opened fire on Robert Kennedy from the front, a CIA agent fired the kill shot at close range into the back of Kennedy's head. The same agent who coordinated the operation and was at the scene, was later brought out of retirement to "handle" the congressional investigation into the assasination. All 3 members of the assasination team are now dead, but many of those connected to them still hold high offices in government. Elements from within the CIA are prime suspects in the murder. Even if you can refute the identifications of the agents seen at the time of the assissination we know from the forensic evidence that the alleged killer, Sirhan Sirhan, could not have killed Kennedy. The US people continue to live under the constrains of the military industrial complex. But remember, there are a lot more common people than there are elites and once their game is exposed, then the game is up. In the first press statement two months after the sinking of the South Korean warship “Cheonan” in March, North Korea Friday said it was not involved in the incident, and asked Seoul to conduct an “objective and fair” probe. Whether or not South Korea received the inspection group from North Korea was the key to judging the “Cheonan” incident, Pak Rim Su, head of the policy bureau of North Korea’s National Defence Commission (NDC), was quoted as saying by Xinhua. If the investigation results of South Korea were “just and honest,” it should receive the inspection group, Pak said, adding that the investigation should be “objective and fair”. Any investigation here, where there are strong objections from the alleged perpetrating country, should be open to the public lest we suspect a cover up. At present the North Korean claims of innocence have merit. The torpedo wreckage retrieved from the sea floor and shown to the public does not match up to the schematics of the alleged type of North Korean torpedo claimed by the investigating team. The truth here is vitally important. It may mean the difference between war and continued truce. Alex breaks down the incredible propagand being displayed by all the major tv networks to brainwash us into thinking like they want us to. The establishment is in full blown panic over the runaway success of Kentucky primary winner Rand Paul and has set about attacking the son of Congressman Ron Paul from every conceivable angle in an attempt to undermine his support base and ensure his defeat by a Democratic opponent in November. Whatever your personal agreements or disagreements with the nuances of Paul’s policies, the fact is that he represents the rarest breed of politician – one not controlled by special interests – and that is a fundamental threat to the status quo and the gravy train for the crooks and scoundrels in Washington DC. The molten metal reports are significant because some include accounts and physical proof of molten steel. 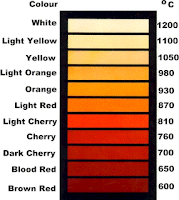 The 600 degree Celsius fires in the Twin Towers and WTC 7 were not hot enough to melt steel (1400 degrees Celsius). Therefore the molten steel indicatates incendiary materials had to have been used on the buildings. There is no other way to cause such heating. The forensic evidence here shows that the WTC destruction was due to inside help. Bin Laden's men could not have rigged the buildings with these materials. (Story from Debunking the Debunkers blog). Because people KNOW about the Fed, things will change. Things have changed in the past. Why not in the future ? And given half a chance Congressman Paul, after auditing the Fed, will abolish it. Why keep a private institution that has control over the country's money supply ? The US Treasury should be in control of the dollar, not the Fed. Get this straight: Being concerned about false flag terror attacks, like 911 and 7/7, is not simply an academic exercise. Too often members of our society thoughtlessly dismiss the threat of staged terror as either fanciful or something abstract that they can't do anything about. Both these views are wrong, narrow-minded, and leave the door open for further victimisation of the population. The main problem we face is that most people have been conditioned towards a highly superficial (or a priori) view about staged terror events - one that is entirely negative. This extremely biased outlook tends to sabotage a person's ability to think independently and discourages basic fact checking. The population is inclined to believe the official story every time because they "know" any alternative narrative "has to be" untrue. This presumptive anti-conspiracy point of view is a direct result of faulty or deceptive thinking pushed by mainstream academia and government spokespeople and amplified in the corporate media. It is a view based solely upon an appeal to authority rather than resting on established facts or verified scientific evidence. It should be emphasised that understanding the truth about false flag terror has nothing to do with intelligence either. It has more to do with our propensity to avoid ridicule and to believe, at face value, many widely accepted arguments put by authority figures. When mainstream intellectuals swear that Western false flag terror events fall within the domain of myth, these individuals always have either a conflict of interest with the establishment (they are authority figures representing defence/intelligence interests) or they have only a superficial understanding of the situation at hand. It follows that other educated people, influenced by these compromised peers, fall into line and accept the half baked assessments spewed forth. The population has been trained to think that mature or intelligent people should always outright reject "crazy" ideas of conspiracy, especially those involving assassinations or false flag terror attacks. It is cultural conditioning that destroys an individual's ability to think for themselves and take action. On another level many people simply don't care about false flag terror. They don't see how anything could be done about it anyway. It is the problem of apathy born out of lack of knowledge. Unfortunately many people in affluent Western society are too absorbed with their own immediate surroundings (having been conditioned on a diet of trivial entertainment) to care about critical world changing incidents resulting from the criminal actions of their own Governments. Leading this apathetic mindset is the general non-acceptance of false flag terror events as FACT. Alas, too many people have lacked knowledge of past conspiratorial deeds-- such as Operation Gladio, Operation Northwoods, The Gulf of Tonkin "Incident", The Reichstag Fire etc -- that they don't realise how common false flag events are in the history of the world. Governments, corporations, military and intelligence groups DO conspire to kill their own citizens. Only information about these crimes can awaken the masses to the dangers of their present way of thinking. Education and a level of imagination will solve this situation. By remaining ignorant and apathetic, it's the lives of your friends, family and kids that are put at risk. Consider what sort of hell-future they will have to endure if no one has the courage to speak up. Things CAN change for the better. The criminals running false flag scams are few in number and they are just men, not Gods. And remember, things that were hard or "impossible" to change in the past do change. The time WILL come when EVERYONE knows the truth about 911 and 7/7. At that point independent Military, Law Enforcement and Judicial officers will be forced to take action to stop the corruption. With an informed population we will see a real criminal investigation (or revolution). The first step is education. When the knowledge of 911 and 7/7 become COMMON KNOWLEDGE a deadly serious distrust will develop of those in positions of power. We will see a radical transformation of the present power structure towards an extremely open, transparent and accountable system. Justice will be done. So be concerned about false flag terror. You can make a difference. Educate yourselves. Educate others. Things can change. The next attack may impact YOU. We have yet to see a biological, chemical or nuclear incident. Michel Chossudovsky on: austerity measures; volatile currencies; solutions as the cause of further collapse; attacks on the euro; war against savings with zero interest rates; increasing rates of poverty; crisis has not yet reached its climax; the current crisis far surpasses the Great Depression; and the Long War. Keiser Report – Markets, Finance, Guillotines, Conspiracies & Social Fury! We look at the scandals of guillotines and conspiracy theories, Fed rackets and capital flows. In the second half of the show, Max interviews Dr. Joern Berninger about the European “debt crisis”, when France was “technically bankrupt” on May 7, and about the China bubble debate. Essential News !! Essential ! The torpedo recovered from the ocean floor is not the same as the alleged North Korean one seen in the blueprints. Weapons experts should have recognised the difference very quickly. The recent reports we are getting in the mainstream media are highly suspect. Perhaps the early report indicating this weapon was of German origin is correct. So far we have seen invasions of Iraq and Afghanistan initiated upon lies. Now we may face the same with this incident. Post this story far and wide. We do not need another unnecessary war. Peter Schiff on CNBC - is US The Next Greece or Japan? There is no doubt about it, there is no longer any reason to hold back, I have looked at the “evidence” and have concluded that we are being lied to, again, by our “leaders” in the White House in order to fabricate a measure of moral justification for yet another “regime change” campaign or an all out war with North Korea. There simply is no “perfect match” like the recent unsigned report claims there is. There are 4 clear differences in the design of these weapons and one is without a doubt, the key to proving these are not the same. * “A” & “D” – Here you can clearly see major differences in the design of the hub of the propellers. In the diagram above you can see it has a smaller hub whereas in the evidence below it, the hub is larger. * “B” – The actual shape of the propellers is very different. You can see a notch in the diagram above that doesn’t exist in the actual evidence propeller below. The overall shape of the blades are vastly different as well, both the front and the rear propeller sets. The wreckage does not match up as far as anyone can tell. If it is North Korean it has to be something that has not been thus far identified in the West. It is possible that the torpedo is of German design as first reported in the press on May 6th. It could be a DM2 A-3 weapon. Unfortunately, there are no clear pictures of this weapon available online for comparison. As soon as more information comes to hand I will post an updated story. We look at the scandals of naked short selling, supplementary liquidity providers and the conspiracy of banks. And we also mention the financial terrorist playing cards. In the second half of the show, Max interviews Jim Rickards about naked short selling and overwhelming the specialist system, Wall Street banks undermining Greece and Goldman Sachs as an undeclared national enemy. With 73 bank failures so far this year, double last year’s pace … with a new phase of the global debt crisis now unfolding … and with the dangers in the Dow I told you about Thursday … this news has far-reaching implications! So I wanted to give you this heads up. There is a global banking Mafia, in cahoots with other shadowy groups, that IS pulling the strings here. Obama is just another puppet. Despite their nefarious agenda, things can be changed if the game is exposed. These elites are not Gods. They are not all powerful, they over-reach, misunderstand the social environments they operate within (especially with regard to the Internet), and they make mistakes. The development of information technology, the spread of knowledge, has torpedoed their long term goals. Explosive demolition is the only valid explanation that can account for the collapse features of WTC7. 911 was an Inside job making the entire War on Terror completely unnecessary. In his inaugural speech in January 2009, US president Barack Obama promised a new beginning in foreign policy towards Iran, saying “we will extend a hand if you are willing to un-clench your fist”. He didn’t actually mention Iran by name then, but everyone knew he was saying that the Bush administration’s confrontational approach to the Islamic Republic was being replaced by a more reasonable policy based on mutual dialogue. Well, we better return to examine everything else promised in that address – about “decent jobs and affordable healthcare” and “America being a friend to each nation and to every man, woman and child” – because the 44th president is now shown to be a liar. The US is pushing for war here - same as they did for Iraq. Obama is merely a relatively sophisticated puppet of the establishment. Keiser and Celente talk about corruption and rebellion against injustice. Rep. Grayson introduces a bill to cut separate funding for the wars in Iraq and Afghanistan, and uses the money to eliminate federal income taxes on every American's first $35,000 of income. Cosponsors of this bill include Ron Paul, Walter Jones, John Conyers, Lynn Woolsey, and Dennis Kucinich. The wars in Iraq and Afghanistan can be stopped immediately if we all accept the truth about 911. New U.S. Taxpayer Funded Website: "There is No Conspiracy"
Translation, it is unpatriotic to question the "official story" on anything. Its too bad that the Founders wrote in that "Freedom of the Press" and "Freedom of Speech" provisions to the Constitution. Otherwise, there would be no need for a taxpayer funded website to debunk "Conspiracy Theorists". EconomicPolicyJournal.com has learned that 32 states have run out funds to make unemployment benefit payments and that the federal governmant has been supplying these states with funds so that they can make their payments to the unemployed. In some cases, states have borrowed billions. As of May 20, the total balance outstanding by 32 states (and the Virgin Islands) is $37.8 billion. If there were no unemployment benefits the US would be a disaster area. Things are not good. The level of economic dysfunction is higher than outwardly apparent or reported. The results are in, and shatter the touted benefit claimed by flu shot advocates. New Brunswick's populace, the only Province in Canada urging people to take the seasonal flu vaccine early last October, came down with 50% higher flu sickness compared those Provinces that did not take the shot. This is shown by the prior four years flu data compiled weekly by the Public Health Agency of Canada, and comparing all of Canada's flu cases to cases only in New Brunswick. Anybody can access the informative official website called Canada Fluwatch and check for themselves, though it's a sure bet U.S. CDC officials will not even peek at anything across the border and counter to their in-house dogma. In fact, last October in a world-wide teleconference to discuss Skowronski's and De Serres' Canada Study, U.S. CDC participants said they could not find any flaws in the Canada Study but nevertheless, no matter, Skowronski and De Serres just had to be incorrect. Is it not wonderful American citizens have such inquisitive, open minds at CDC? -- "just take your damn flu shot." More research is needed here. One thing that can be said for sure is that there is a lot of money involved in producing flu vaccines. Making money trumps good science and safe flu shots that actually work. Keiser Report – Markets! Finance! Scandal! – And The Gold Standard with J.S. Kim ! This week we look at the scandals of lying children, probing banks, Wall Street barbarism and German fantasies. In the second half of the show, Max interviews J.S. Kim, Chief Investment Strategist for SmartKnowledgeU, about systemic fraud in the Wall Street casino scam and a return to the gold standard. Essential economic news - stuff that impacts everyone ! Even if you don't understand economics it's worth checking out each episode. If the results of this research mean that creating new life is not so difficult (as opposed to near on impossible) then we can expect life to exist in many other regions of the Galaxy. The research here will add to the likelihood of intelligent life being present as defined by the Drake equation. The Fl value will be higher. (Fl = fraction of habitable planets around stars that have life). 10 years ago the chances of life forming would have been considered as much lower. Also note: All the new planets being discovered at present, have added to the likelihood of life being present as per the Drake equation's Fp value. (Fp = fraction of stars with planets). I'd guess that life is fairly common out there. The building blocks of life are common throughout the Universe and now it appears that putting them together to form a living organism may not be as impossible as previously reckoned. Oreskes reviewed 928 abstracts from peer-reviewed research papers and determined that more than 75 per cent of scientists either explicitly or implicitly accept that Earth’s climate is being affected by human activities. Thus the ‘scientific consensus’ claim was born. However, according to a peer-reviewed analysis of Oreskes by Dr. Benny Peiser, a world-renowned expert on ‘neo-catastrophism,’ it appears the claims by Oreskes are false. Dr. Peiser uncovered from the 928 abstracts that; “just over a dozen explicitly endorse the ‘consensus’ while the vast majority of abstracts do not mention anthropogenic global warming.” Moreover, the term ‘catastrophic warming’ appears nowhere in any of the papers. I am not against clean technology, but I am FOR truth in science. At the moment we have a situation with corrupted data from the CRU and NASA being used to back people's false premises that we are in a period of significant warming. The Earth's temperature fluctuates. It was hotter during the medieval warming period and now global temps appear to be in decline. George Carlin on "Freedom of Choice"
The owners of the USA make sure the choices you have available are limited. This can change, but it will take a lot of work. Education is the key. If EVERYONE knew about this predicament, and thought the situation was dire enough to take action, then things would change. If you can imagine what is necessary so that things can be made different, then a solution IS indeed possible. 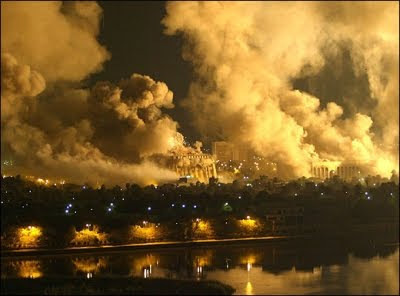 Why they Lied to Have a War in Iraq: The NeoCon Agenda. Lies were told by Western political leaders so that we saw War in Iraq. If we recognise 911 for the inside job that it was, we can see the agenda here was to weaken any, and all, opponents to the State of Israel. The fact there is oil in Iraq provides further cause for war by the corrupt. The fact that Obama has done nothing to address what happened, that his Administration has failed to investigate the Iraq War lies, failed to hold Bush Administration officials accountable for torture, failed to restore the US Constitution and abolish the Patriot Act- reveals this President to be just another puppet of the establishment and its interests. Although we are pumping tons of carbon into our atmosphere, which I don't think can be a good thing, Ice Ages are thought to occur due to the (lack of) heat coming from the Sun. The Sun's intensity waxes and wanes as part of its natural cycle and there's nothing we can do about it. At present the sun is waning. Furthermore, NASA has determined that the upper atmosphere has cooled somewhat in recent months. So rather than warming, we might see a period of global cooling. Having said that, it is still a good idea to make plans to lessen our impact on the environment in the expectation there will be no immediate return to a glacial period. Clean technology is good from a pollution and sustainability standpoint. I have re-posted this story in light of recent claims that we might soon experience a new "Little Ice Age". Up to date info on the European financial crisis. We look at the scandals of real time fraud as quoted on the ticker tape; the more ‘perfect quarters’ and even more ‘missing records’ as the US government hands out tens of billions to TARP banks. In the second half of the show, Max interviews Jim Rogers about the euro, naked short selling, and gold. It seems to me that indications of Global Warming have stemmed from short term temperature fluctuations (likely caused be changes in the Sun's output) and from variations in ocean currents like seen with el Nino. Some areas have warmed slightly and some have remained constant. At present the Global Temperature seem to be in decline (aka "hide the decline"). In a move that will likely drive a stake into the heart of the near-term prospects for the US-backed “crippling sanctions” against Iran, Turkey and Brazil have managed to come up with a compromise deal that provides everything the Western nations claimed to have wanted from the third-party enrichment deal in the first place. Though the inclusion of Turkey is a new rub, everything else about the deal seems to be designed to be verbatim to the P5+1 deal in October, which the Obama Administration has repeatedly demanded Iran sign. Iran’s problem with the initial deal with the use of France as an intermediary, as France has previously reneged on nuclear deals with Iran and was not trusted by many in the government, who thought they might simply make off with Iran’s stockpile. This is an important development. Iran has not broken any laws and has always fulfilled its obligations under the Nuclear Non-Proliferation Treaty. Claims that Iran has broken International Law are simply not true. Max and Dr Keen talk about the danger of private debt - the fact that sophisticated banking corporations loaned out money to people who could not easily afford to pay back the loans. The Global Financial Crisis was fuelled on this easy money. However, while the banks can be bailed out of trouble, the people remain stuck in their predicaments. The diabolical nature of this military project was adopted and implemented from the very outset of the Obama administration. With a new team of military and foreign policy advisers, Obama has been far more effective in fostering military escalation than his predecessor in the White House. Under the Obama presidency, this global military project has become increasingly pervasive. Military escalation as well as the Worldwide deployment of US military might are an integral part of America's "long war" military doctrine, to which the current administration is firmly committed. Obama's just another stooge for the military industrial complex. Nothing has changed. Even the torture program continues unabated in hidden locations. A revolution or military coup is desperately needed in the US so the people can kick out their corrupted political "representatives". There is no easy way out of this fight, but things MUST change. Presently the future appears to be one of endless Middle East wars, and possibly war in Africa or South America, using the War on Terror as the justification. Added to this nightmare scenario is the horrific fact that the US military employs genocidal Depleted Uranium munitions as part of its war fighting arsenal. D.U. is an anti armour munition that also causes extremely long lasting radiological contamination. US leaders who push for more war must be stopped. The people of the USA will have to stop them. And remember, it is because of 911 that these wars exist. Americans have a problem with the truth. They seem to be unable to accept it, which is difficult to understand at a time in history when knowledge plays a larger and larger role in determining human action. Paul Craig Roberts writes, "Today Americans are ruled by propaganda. Americans have little regard for truth, little access to it, and little ability to recognize it. Truth is an unwelcome entity. It is disturbing. It is off limits. Those who speak it run the risk of being branded 'anti-American,' 'anti-semite' or 'conspiracy theorist.' Truth is an inconvenience for government and for the interest groups whose campaign contributions control government. Truth is an inconvenience for prosecutors who want convictions, not the discovery of innocence or guilt. Truth is inconvenient for ideologues." This debasement of truth stems from two misguided beliefs that many Americans hold. They affect much of American society and define the American psyche. One belief is that the truth emerges from a debate between adversaries. The other is the belief that everyone has a right to his/her own opinion. Many American activities are based on the these beliefs. In law, the system is called adversarial. The prosecutor and defense attorneys are adversaries. Each side presents its evidence and the truth is somehow supposed to emerge. In journalism it is called balance. Two adversaries are asked to give their sides of an issue, and the truth is somehow supposed to emerge. In politics, it is called the two party system, where the majority party and the minority party, often called the opposition, are adversaries who present their sides of the issue. Again, somehow it is believed the truth will emerge and effective legislation will then be enacted. But it doesn't work, never has, never will. In a corrupt world ruled by big money and corporate media it is more important than ever NOT to take mainstream points of view for granted. I am reminded of the quote, "If they can get you asking the wrong questions then they don't have to worry about the answers." In today's society it is vitally important to challenge mainstream sensibilities (propaganda) and consult the online alternative press. It is fine to consider differing opinions when the matter at hand is truly debatable, but it should be remembered that some opinions can be blatantly false ones. Having a blatantly wrong opinion, which flies in the face of established fact, is something that needs to become a new talking point in society. Too few media articles deal with facts. Often the media simply pushes PR, especially those stories that have a corporate agenda or those supporting the US War on Terror. The idea that people (or journalists) are entitled to have any opinion that they like, without considering the consequences as to whether their view is false, cannot stand. Keiser Report 42: Flying Pigs to the Rescue ! This time Max Keiser and co-host Stacy Herbert look at the scandals of perfect trading days; PIIGS flying only to fall to earth five minutes later when markets realize the Euro-Tarp financiers are themselves bankrupt debt pigs; and Max Keiser explains high frequency terrorism in the Manchurian candidate markets. In the second half of the show, Max interviews post-neoclassical economic philosopher Damon Vrabel about the European bailout, the financial empire and the IMF, and how the right kind of republic can provide some solutions. Even if you don't know much about economics this is a MUST WATCH show. Max and Stacy provide all the warning you need of impending trouble in the financial world. The American desire is to wage a war in North Waziristan against Haqqani / Afghan Taliban networks. Pakistan army is not willing to do that ... But in the end, the US plan of waging a war in North Waziristan fizzles out. These intelligence games are played via proxies (assets) who pull strings in order to get the desired results. Sometimes a direct hand is involved, but often not. The Iraq War was SOLD on LIES. There would have been NO conflict, and NO massive death toll without these lies. The War was completely unnecessary and constitutes a War Crime. War Crimes Trials need to be initiated immediately. 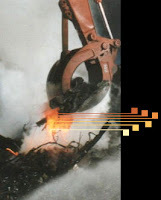 The picture above shows MOLTEN STEEL being removed from the World Trade Centre rubble pile. However, from all accounts (even the official NIST report concedes this point) the fires in the WTC buildings were far too weak to cause such melting. Conventional building fires, including ones initiated with aviation kerosene, simply cannot raise the temperature of structural steel to its melting point of around 1300 degrees celsius. According to all the available data, the fires in the Towers could only have reached a maximum temperature of around 650 degrees celsius- yet here we can see steel so hot that it has taken on a yellow look (an observation that indicates the temperature must be between 1050-1100 degrees celsius !!). UPDATED: In a peer reviewed scientific paper it has been show conclusively that particles of high tech explosives were present all throughout the WTC dust. There is no doubt about it. These buildings WERE destroyed using thermite-type incendiary explosives. Note: I will continue to post 911 information at this blog, ad infinitum, until we see a proper criminal investigation. Once everyone can see that 911 was an inside job (and be able to openly talk about the crime) action WILL follow. After the collapse of the World Trade Centre buildings previously molten iron spheres were found all throughout the dust which blanketed lower Manhattan. 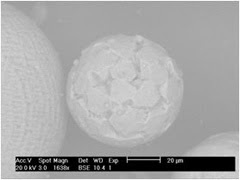 These tiny spheres were corroborated by the EPA & USGS but not explained. 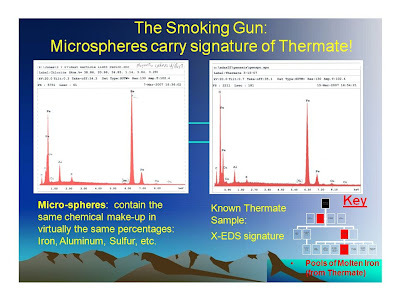 Later analysis by physicist Steven Jones revealed these spheres to bear the chemical signature of the incendiary THERMATE. Traces of Aluminium, Fluorine, Manganese, Sulphur and Potassium indicated the exotic nature of the metal. The physical match was unmistakable. Significantly the THERMATE signature, that was evidenced from these iron spheres, ruled out their origin as being from the welding done during the WTC construction or the clean up following the attacks. Iron spheres from welding would not have a mix of these highly unusual elements. One other observation: the heat required here, necessarily over 1500 degrees celsius (the melting point of steel), which is needed to form the spheres through surface tension while the steel is liquid, was far in excess of the temperatures reached in the building fires. Official reports put these fires at below 1000 degrees celsius. This temperature gap cannot be ignored. The only way we can account for such a huge discrepancy is to consider another agent, which in this case is clearly THERMATE. It was not only the dust that showed signs of foul play. 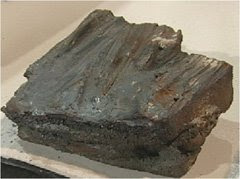 Further analysis on a sample taken from a steel beam recovered from the rubble pile also showed the thermate signature. From the high percentage of iron spheres found in each dust sample it has been deduced that a great deal of the building steel had been subject to the action of high temperature incendiaries. The evidence here is damning. The highly unusual collapse of all three buildings was undoubtedly due, in part, to the action of the incendiary Thermate. See this link for more information: http://www.ae911truth.org/twintowers.php and here for a video lecture on this evidence. However, in the case of the WTC7 building, the massive structural columns appear to have vanished into thin air for at least 2 and a half seconds ! Of course the most reasonable explanation to account for this incredible phenomena is the use of an explosive agent that can remove resistance almost instantaneously. In this regard we have abundant physical evidence showing that this is exactly what occurred in the form of the molten steel and the thermate products that were discovered in the rubble subsequent the collapse. 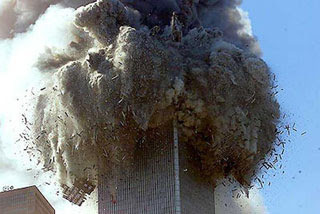 Without doubt, Building 7 WAS brought down using explosives. Adding to the damning material presented in the clip are the two witnesses inside WTC7 who were almost killed by explosions going on inside, explosions that happened before any of the Towers came down. Clearly bombs were present in this building. 911 WAS an Inside Job. Tell everyone so that this information becomes public knowledge. When EVERYONE KNOWS the truth the perpetrators will be unable to hide from the hand of justice.